Mum of Five Staying Sane: The mother's letter to the bullies who drove her son to kill himself. How we as parents can do more to prevent bullying in school and via social media. The mother's letter to the bullies who drove her son to kill himself. How we as parents can do more to prevent bullying in school and via social media. I watched yesterday on This Morning as the mother of Felix Alexander opened up about her sons death just six short months after losing him. 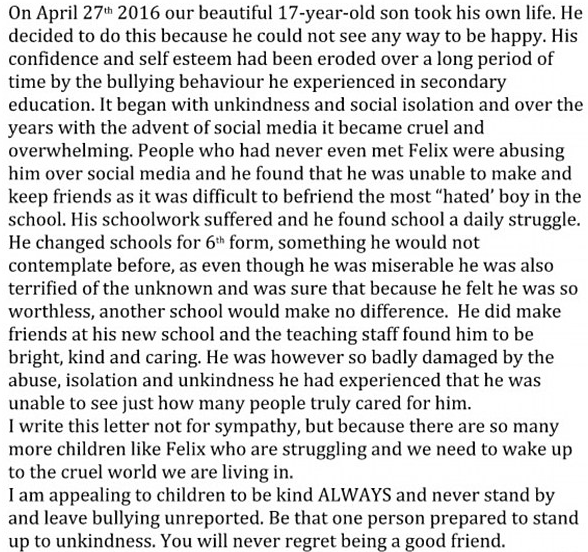 Felix was just 17 years old when he took his own life because he had been bullied for seven years. Bullied in school and via social media. Every day he went to school and was taunted by classmates, one instance being because he wasn't allowed to play a particular computer game that others were playing. Over the seven years of bullying Felix's confidence and self esteemed plummeted and he became Felix, the boy who everyone hated. Why did this escalate to the extent that it did. 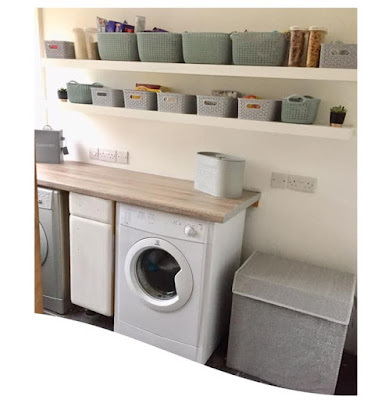 Moving from bullying within the school onto social media platforms where, even at home, he was taunted and called names by people he knew, people from school. 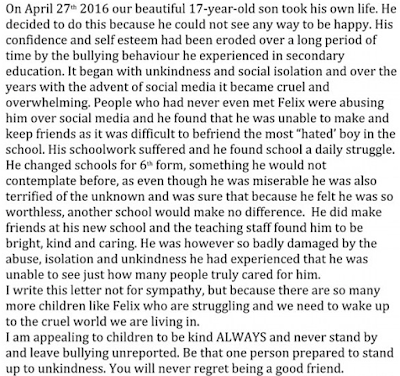 Part of the open letter that Lucy, Felix's mum, wrote following the death of her son. There was no reason for this to happen. As I said earlier, one reason was because he didn't play a particular computer game. Why does that make him any different from anyone else. Why does the colour of your hair, or the way you dress, or the brand of trainers you are wearing define others perceptions of you. Why is it acceptable for people to sit behind a keyboard, behind their computer screens and mock and bully people for the things they do or don't do. I am certain that in our current social media culture people find it so much easier to say things online, like they can't cause offence with their words because they aren't saying them face to face. The word 'BANTER' gets thrown around a lot too. However, once those words have been said, they can't be unsaid. You've said that to someone and those words can make a huge negative impact on that person. You may think you are the only person to have said something bad but when someone is affected every day by words said by many they get battered down until they can't take any more. For this to have gone on for seven years is shocking. To go to school every day and be subjected to the bullying that he did and then to see it online too is awful. There is so much that I see on social media about bullying and none of it is positive. None of it is about prevention and protection. It is all about the aftermath, the effect it has on a person and then a whole family. We see videos of people being bullied physically and you wonder why someone could even stand there and film it rather than step in and help. How they can stand there laughing whilst someone else is hurt. Just this week we have had an instance of hatred via social media resulting in my child having a huge meltdown. The whole family suffered whilst he dealt with the negativity he had received via social media. One person taking it into their hands and deciding that today is the day I am going to say things to someone else via social media because it's easy to type it in a message and press send and then not think about the consequences. My child bottled this up for days, he let his anger hide away until it got too much and then the fall out was immense. What if we hadn't have found out? What if he had let it stay bottled up and the abuse had carried on? After the fall out we witnessed the other day from it, had it got any worse I don't know what he would have done. That is how people are affected though. It eats them up inside, they can't get away from it. It carries on relentlessly and it doesn't stop because sometimes others aren't quick enough to step in. Others won't step in and say I will help, I will be your friend, this needs to be stopped. We as parents need to step in and take a closer look at what our children are doing when accessing social media. It doesn't matter how old they are it needs to be monitored. Do you know what your child is up to when they are online? Do you know who they are talking to or what kind of conversations they are getting in to? Do you know what kind of things they are watching online? KINDNESS. Where has our kindness gone. It seems that some find it easier to jump in and be nasty and bully someone rather than join in when someone is being kind. We are all the same, we are all human and we all have feelings that get hurt easily. Whether we play Xbox or PS4, have blonde hair or brown, where we live, what we wear, how much money we have, which school we go to or where we go on holiday. None of this defines who we are as a person, we are all the same.